Orian/Theta healing came into my life at a time when I was looking for more spiritual direction. A friend of mine Peter introduced me to Theta healing to help physical and emotional issues. After 1-2 treatments of focusing on my life long belief patterns, I started to feel completely different. I started to approach issues in my life from a new perspective, and since attending DNA 1&2 with Colleen Clark 3 years ago the changes in my life have been immense. 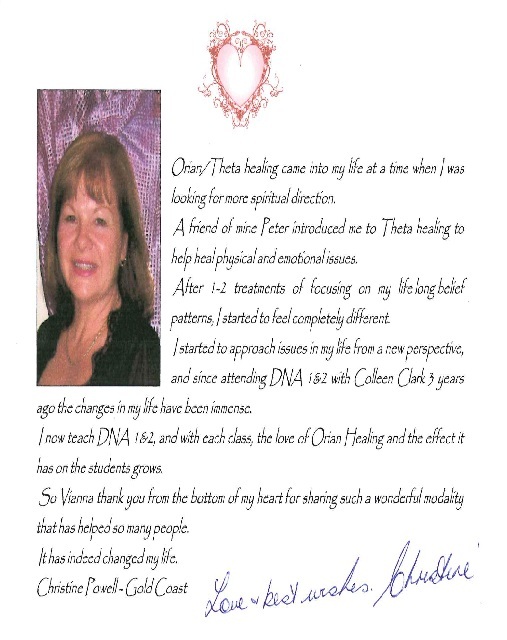 I now teach DNA 1 & 2, and with each class, the love of Orian Healing and the effect it has on the students grows. So Vianna thank you from the bottom of my heart for sharing such a wonderful modality that has helped so many people. It has indeed changed my life.